Wondershare PPT to Video is an all-in-one PowerPoint to video converter. 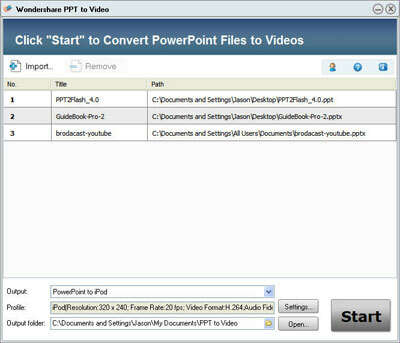 This PowerPoint Presentation to Video Converter can convert PowerPoint presentations to almost all popular video formats like PPT to MPEG (MPEG-1,MPEG-2), PPT to AVI, PPT to MP4, PPT to WMV, PPT to MOV, 3GP, iPod, iPhone, Zune, PSP, Pocket PC and Apple TV with excellent quality. Now you can not only play a PowerPoint presentation on your iPod, iPhone, Zune, Pocket PC or Apple TV, but also convert PowerPoint presentations to video to easily share them online (PowerPoint to YouTube, put PowerPoint Presentations on your blog). • Convert PowerPoint to video and watch it without MS PowerPoint ! • Supports PPT to MPEG (MPEG-1,MPEG-2), PPT to AVI, PPT to MP4, PPT to WMV, PPT to 3GP, PPT to iPod, PPT to iPhone, PPT to Zune, PPT to PSP, PPT to Pocket PC, PPT to apple TV video conversion. • Burn converted PowerPoint Presentation to DVD/VCD. • Convert PowerPoint to YouTube/MySpace. • PowerPoint to streaming video (broadcast on screen or streaming online). • Retain audio and video synchronization accurately with the timeline editor. • Easy to use, flexible settings and batch PPT to video conversion. • Supports Microsoft PowerPoint 2000/2002/2003/2007.